Why Hire Brass Ring Mobile Music? I really enjoyed this article, so I thought I’d put it up here for you all to enjoy. Women? Broads. The whole world? A giant smoking section. The booze? Flowing freely. Las Vegas was a curious desert oasis of a shade more than 64,000 residents permanently, a few million visitors annually. Proximate atomic tests occurred monthly, while the Cold War was hot news. Simmering discontent over the conformist mindset of the Eisenhower years was seeping into public consciousness. Racism was still in significant public flower throughout many parts of the United States. Welcome to 1960 and the second generation of the Rat Pack was about to provide a new vision for the cultural zeitgeist of America. 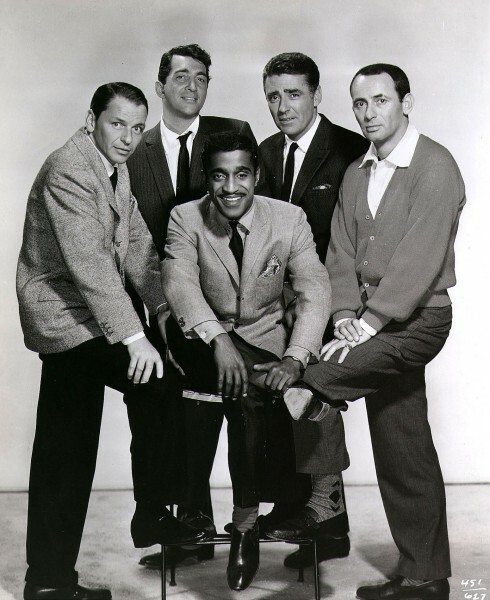 The legendary quintet of Frank Sinatra, Dean Martin, Sammy Davis Jr., Peter Lawford and Joey Bishop; two Italians, one black, one Hollywood-naturalized Brit, and one Jew; three of them second-generation immigrants; four raised during the Depression in ethnic city neighborhoods comprised what became known publicly as the Rat Pack in the 1960s. Powerful, successful, connected, narcissistic, occasionally vulgar, always entertaining, remarkably captivating, the five were not the first supergroup to lay claim to American cool in the entertainment world. Fame comes with its own standard. Sammy Davis Jr. In 1949, Sinatra moved his family from Los Angeles Toluca Lake section to Holmby Hills, purchasing a home just blocks from one of Hollywood’s leading couples, Humphrey Bogart and Lauren Becall. Sinatra was quickly inducted into the knit of Bogie’s drinking buddies. The group was created, according to Bogart, for the relief of boredom and the perpetuation of independence. We admire ourselves and don’t care for anybody else. According to Stephen Bogart, Humphrey’s son, the original members of the what became known as the Holmby Hills Rat Pack were: Sinatra (pack master), Judy Garland (first vice-president), Bacall (den mother), impressario Sid Luft (cage master), Bogart (rat in charge of public relations), agent Swifty Lazar (recording secretary and treasurer), author Nathaniel Benchley (historian), David Niven, Katharine Hepburn, Spencer Tracy, director George Cukor, Cary Grant, Rex Harrison, and composer Jimmy Van Heusen. But what about the name Rat Pack? Well, history has a way of getting lost along the way, but, according to the History Channel, Bacall observed the crew in the living room of the couple’s home and noted that they looked like a bunch of drowned rats. The name morphed and stuck. When Bogart passed away in 1957, the Holmby Hills Rat Pack faded away. However, Sinatra, fond of the presence of others, sought to develop his own Rat Pack. Davis, Martin and Sinatra all recorded for Capitol Records in the 1950s and sealed their friendship and the core of what Sinatra preferred to call The Clan initially in 1958 on the set of the film, Some Came Running, which also featured the future Rat Packette, Shirley MacLaine. It’s just a bunch of millionaires with common interests who get together to have a little fun, said Sinatra. Late in 1958, Lawford, who married John Kennedy’s sister, Patricia, in 1954, purchased a screenplay and showed Sinatra. Sensing a good fit for his coterie of show business pals, Sinatra put the wheels in motion to have his production company, Dorchester Productions, helm the comedy heist, Ocean’s Eleven. Since the film would be almost exclusively shot in Las Vegas, Sinatra decided that the Rat Pack would film by day, perform shows at night and party until the wee hours of the morning. The cycle continued from January 26 through February 16, 1960�rinse and repeat. One take on location (much of the movie was shot in the five casinos that were robbed in the motion picture) preceeded many drinks on stage and plenty of carousing overnight. �We�re not setting out to make�Hamlet�or�Gone with the Wind,� Frank asserted in the midst of shooting�Ocean�s Eleven. �The idea is to hang out together, find fun with broads, and have a great time.� A Rat Pack mantra. Borrowing from the international headlines, where President Dwight Eisenhower, Nikita Khrushchev, Harold Macmillan and Charles de Gaulle were meeting in the Four Powers Paris Summit, the two performances nightly in the Copa Room were billed as �The Summit at the Sands.� The Sands was �A Place in the Sun� where the marquee screamed �DEAN MARTIN� and suggested �Maybe Frank, Maybe Sammy� and, indeed, attendees never knew who might headline or who might pop in from the Summit, the name the members of the group employed instead of the public and press-favored, Rat Pack. It didn�t matter who appeared or what the crew was called��the conference of cool,� per Sinatra, was hot. Although February was traditionally a slow month, the hotel received 18,000 reservation requests for its 200 rooms. Word traveled fast about the Summit�s wild shows, significantly scripted and anchored by Bishop, the emcee, whom Sinatra called �the hub of the big wheel.� Between star turns by Martin, Davis, and Sinatra, and dance numbers with Davis and Lawford, the five wandered off to the wings, parodied each other, did impressions, and poured drinks from a bar cart they rolled and kept on stage, like a sacrificial altar to Rat Pack hipness. The price of a ticket to see the Rat Pack at the Sands? Dinner and a minimum of two drinks: $5.95 per person. So successful were their swinging shows at The Sands, so popular was the free-wheeling Ocean�s Eleven, the Summit made frequent forays into Vegas for sold out shows and more adventures on the screen with�Sergeants 3�and�Robin and the 7 Hoods. Extending their power beyond the confines of Hollywood, the members of the Rat Pack embraced racial equality, the on-stage barbs at Davis� expense notwithstanding. They donated money from ticket sales to Martin Luther King Jr. and afforded Davis equal billing on the marquee at the Sands, an uncommon move in an era that had yet to see the Civil Rights Act. Their politics were left-leaning and, ultimately, proved to be the field of their dissolution. Sinatra adapted and recorded the song, �High Hopes,� as a song for JFK�s campaign. The Rat Pack sang the national anthem to open the 1960 Democratic National Convention in Los Angeles, which nominated Kennedy for President. Kennedy defeated Republican Richard Nixon to become the 35th President of the United States in 1960. While members of the Rat Pack endured occasional internal scrabbles�fallouts were a regular occurrence in the familial group�a dispute that unfolded during the Kennedy administration fractured the close-knit crew. In 1962, on a request from Lawford, Sinatra prepared his home in Palm Springs for a visit from Kennedy. The Rat Pack leader ordered a new bedroom, office and cottages for Secret Service personnel and even built a heliport for the anticipated Presidential outing. Sinatra envisioned the home as the new �Western White House.� However, days before the scheduled stay, a photo of Sinatra hugging Sam Giancana�taken when the mob boss was walking off a plane�hit the nation�s papers. Advised by his brother, Attorney General Robert Kennedy and other White House consultants to create distance between himself and Sinatra because of the latter�s alignment with reputed mob members, the visit was canceled. Reportedly, Lawford arranged for Kennedy to stay at the Palm Springs home of Bing Crosby, a staunch Republican, instead. The unforgiving Sinatra refused from that moment forward to share a stage with Lawford. And, the beginning of the end of the Rat Pack was now in motion. But their impact was lasting. Their brazen attitude and lack of political correctness, surprisingly, cast them in a rebellious light publicly. No, they were not the younger generation with newly-found discretionary income, cars and rock & roll music. They were your parents� rebels. They operated by their own rules, wore their code of ethics proudly, created their own lingo, courted enemies, took care of the little guy, cherished their �pallies�, discarded regrets, flaunted rules, worked to live, shunned permission, embraced the moment, practiced chivalry, hid the sweat, spent lavishly, eschewed sleep, brought the party with them, exuded class, and swung like crazy. Love them or loathe them�the Rat Pack entertained and captivated the nation and the world. Now that, Charley, is a gas. Exclusive Outtakes from Motion Picture: "The Wrecking Crew"
Great Fun at Poway Weapons & Gear Expo 2017! Brass Ring Mobile Music Has Added Rollings Stones Magazine AND MTV News Feeds to Website!